Dinnertime is made easy with this amazing Slow Cooker Beef Brisket Sandwich Recipe! Grab just a few ingredients and let this cook while you work. If you enjoy slow cooker recipes, check out my braised beef and braised beef short ribs recipe video! Busy days mean I need something that is easy to make and delicious. My slow cooker beef brisket sandwich is just the meal for those days when you don’t want to think much about dinner. Like any slow-cooked meal, the crockpot does all the work. This beef brisket is so tender and moist it practically melts in your mouth. Serve it with simple sesame buns or any of your favorite bread. For a complete list of ingredients with measurements and full directions, see printable recipe below. Create a dry rub using seasonings as directed. Brown the brisket on all sides in a large skillet before placing into the Crockpot to cover in sauce and cook as directed. 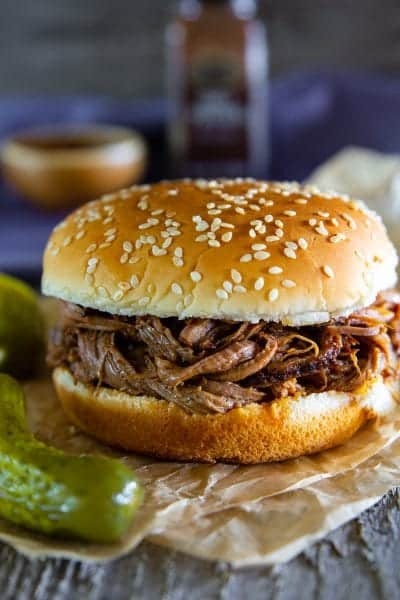 I know you will be wowed by my slow cooker beef brisket sandwich recipe, but there are tons of other great ideas for sandwiches on the blog. Sandwiches are ideal for lunch but don’t forget about a nice simple sandwich for dinner. They are ideal for busy days, or when you want something lighter as a meal. I’ve linked some of my other popular and personal favorite recipes below for your convenience. Combine the chili powder, salt, and black pepper. Generously rub both sides of the beef with the dry rub. Thoroughly stir together the ketchup, molasses, brown sugar, liquid smoke, and chicken stock. In a large skillet, heat olive oil over high heat and brown both sides of the beef. 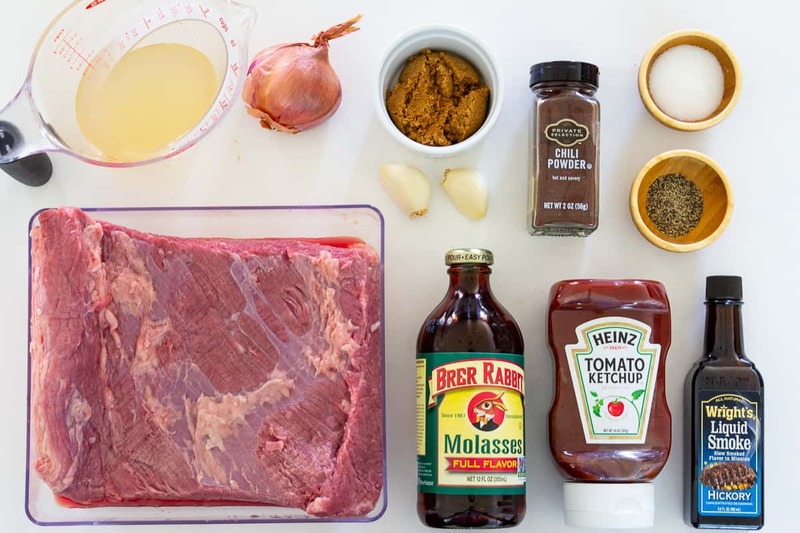 Place the browned beef in a crockpot. Add in the sauce, minced garlic, and chopped shallots. Using a spatula stir gently to thoroughly coat the beef. Cook on high for 4-5 hours. 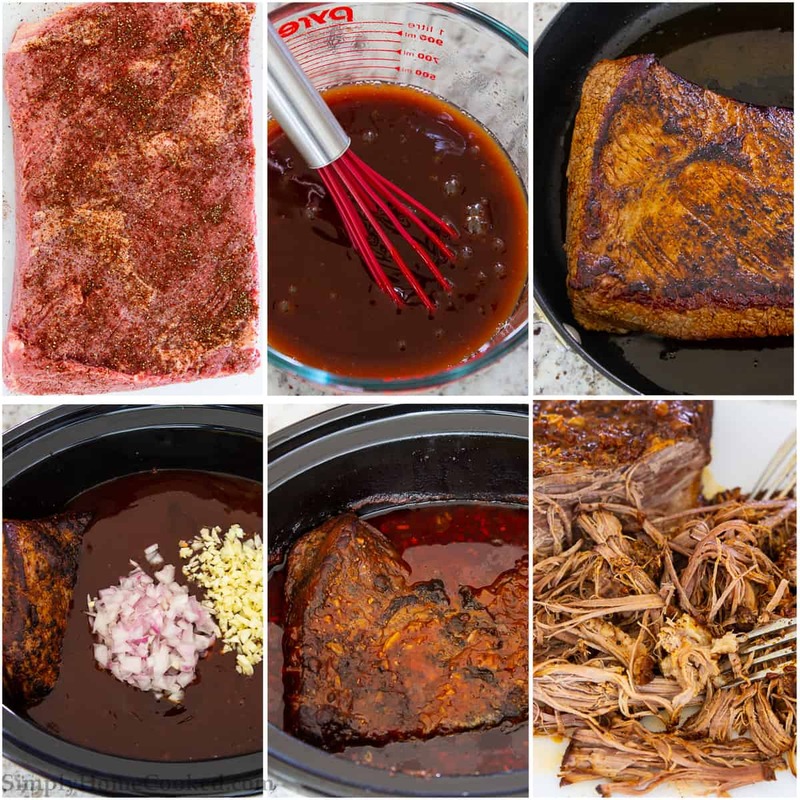 Once the beef is cooked, remove from the crockpot and shred using two forks. Return the shredded beef back into the crockpot and serve warm over burger buns. Nutritional Information is for 8 ounces cooked brisket and 1/4 cup sauce. This does not include the bun.